Later this week, the plan to build a High Speed Rail line connecting Los Angeles and San Francisco faces a crucial vote in the California legislature. Governor Jerry Brown asked lawmakers to release $2.7 billion of the $6 billion in bonds passed by California voters in 2008 for High Speed Rail. Combined with $3.3 billion in federal funds, the allocation would build 130 miles of High Speed Rail in the Central Valley. Currently there are three competing visions for High Speed Rail in the Golden State. For simplicity’s sake, we’ll refer to the three as: The Governor’s Plan, Plan B, and No Rail. The Governor’s Plan refers only to his request to spend $6 billion in the Central Valley, not the entire route. To help you keep track of who is saying what over the next several days, Streetsblog presents your High Speed Rail scorecard. The Plan: The Governor’s Plan would create a high speed rail network connecting Los Angeles and San Francisco. The plan would also pay for the electrification of existing Caltrain and Metrolink rail so these tracks could be used for high speed rail, but would also speed up local service for thousands of commuters. The new long-term plan would spend $68 billion, create over 500 miles of High Speed Rail and 100,000 “job years.” The first leg of the plan, or the Governor’s Plan as we’re calling it, begins with 130 miles in the Central Valley. Why the Plan Could Happen: The Obama Administration clearly stated that it will not allow funds set aside for High Speed Rail to be used for other projects. The new business plan released this Spring has drawn praise not just from party loyalists easy to please the governor, businesses that would stand to benefit from the construction and unions desperate for work; but also from transportation reform groups such as Move L.A. in Southern California and Transform in Northern California. Why It Might Not Happen: The CA High Speed Rail Authority just experienced four rough years in the press with most of the wounds self-inflicted. The current plan might make sense, but past plans angered the public at-large. A recent poll by the Los Angeles Times and USC found that a clear majority, 55%, would vote against High Speed Rail if it were on the ballot this year. Even supporters of California High Speed Rail admit that the plan voters approved in 2008 is very different than the one proposed by the Auhtority and backed by the Governor today. The 2008 plan cost $45 billion and was supposed to fund 800 miles of rail connecting San Diego to Sacramento. The current plan, while an improvement over an interim $100 billion plan, is a lot more expensive and covers roughly 300 less miles. To make matters worse, the current plan relies on bonding against future operations revenue, meaning it will be generations before High Speed Rail, without another major government funding boost will reach Sacramento or San Diego. Even if the legislature lines up, there’s also the small matter of the five existing lawsuits against the project. Lastly, the plan is lambasted by fiscal conservatives who claim that the state simply can’t afford the line in today’s economy. For more: The most consistent voice in favor of this proposal is the California High Speed Rail Blog by Robert Cruickshank. Cruickshank is not affiliated with the High Speed Rail Authority or any political faction. Cruickshank recently posted a link to the national “People for Trains” website’s action alert urging California legislators to support the Governor’s plan. Transform and Move L.A. are linking to the Action Alert by Californians for High Speed Rail. A $2 billion tunnel through downtown San Francisco to bring commuter rail service – and, eventually the bullet train – into the city’s new Transbay Transit Center from the Caltrain station more than a mile away. $1.5 billion in Los Angeles-area rail improvements, including a redesign of Los Angeles Union Station’s rail access and construction of rail overpasses. Together, the projects would speed rail service for hundreds of Amtrak and Metrolink trains each day and end chronic traffic bottlenecks. A $1.5 billion Central Valley bullet train line between Fresno and Madera – but with no immediate connections to Merced or Bakersfield. Why the Plan Could Happen: To pass the Senate, the Governor’s funding request needs 21 votes. Assuming all Republicans vote against the proposal, only five Democrats would have to vote against the plan for it to fail. Lowenthal’s and DeSaulinier’s no votes narrow the Governor’s “margin of error” in the Senate. If the Governor’s plan fails, Plan B could well be considered better than nothing. Why the Plan Probably Won’t Happen: There’s been little popular support for the plan, because nobody really knows about it. The mayors of San Francisco and Los Angeles are lined up behind the governor’s plan. There’s also a good chance that if this plan were to pass the Senate and gain the support of the Governor and Assembly, it wouldn’t gain the support of the Obama administration which allocated $3.3 billion for a specific high speed rail corridor. The Federal Transit Administration has not weighed in on the proposal, but when governors in Wisconsin and Florida tried to change what federal High Speed Rail dollars would pay for, the administration pulled the funding. Spokespeople for the California High Speed Rail Authority have also stated that Plan B wouldn’t pass federal muster. For More: There isn’t a lot of information or support for Plan B on the internet yet. The Plan: If the legislature doesn’t deny funding for the Central Valley portion of the line, then a group of small government activists are trying to get the signatures for a repeal of the 2008 ballot proposition that funds California High Speed Rail. Based on current polling, such a ballot proposition would likely pass. Why the Plan Could Happen: It’s hard to see the Governor push for a controversial vote he might not win, but stranger things have happened in California. If the funding plan does pass the legislature, then the people pushing for the ballot initiative will need 504,760 signatures of registered voters, or 5% of the total number of votes in the last gubernatorial election, to get the funding reversal on the ballot. While that’s a tall task, the vocal support and signature gathering effort of Southern California radio hosts “John and Ken” could gather many of the signatures themselves. The KFI talk show hosts have over 1.1 million listeners on the average weekday, the highest for a local talk show in the country, and are hosting their first signature gathering event in Anaheim later today. To call “John and Ken” listeners politically motivated would be an understatement. A statewide effort is also underway by Re-Vote Rail. While their website has all the tools one needs to gather signatures on their own, it seems the group doesn’t have the funding to launch a signature gathering effort on their own. The signatures are due in mid-July. Why the Plan Probably Won’t Happen: 504,760 is a lot of signatures. Without a well-funded, coordinated campaign it is unlikely that they will make the deadline for a ballot initiative. However, that might not be the main reason for the signature gathering campaign. “John and Ken’s” rally, and others like it, are making a lot of anti-High Speed Rail noise at the same time the legislature is considering the unpopular measure. 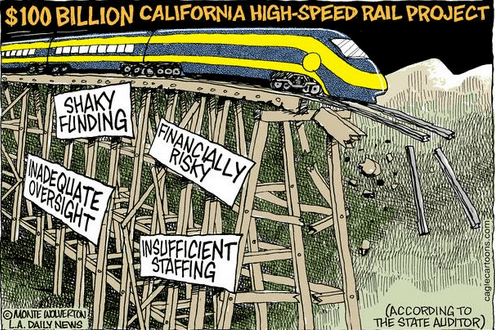 Plan B is a smokescreen intended to torpedo HSR in California. It gives up the federal money and won’t lead to a high speed rail system in California. It probably won’t even lead to local improvements since it will be very difficult to meet the requirements to release the bond money. A $2 billion tunnel through downtown San Francisco to bring commuter rail service – and, eventually the bullet train – into the city’s new Transbay Transit Center from the Caltrain station more than a mile away.$1.5 billion in Los Angeles-area rail improvements, including a redesign of Los Angeles Union Station’s rail access and construction of rail overpasses. Together, the projects would speed rail service for hundreds of Amtrak and Metrolink trains each day and end chronic traffic bottlenecks. and spending the other $64.5B on local and regional transit service, complete streets, vanpool expansion, and linear (bikeable) parks and urban waterway revitalization. Doing all that might not even cost $64.5B. I’m pro-HSR, but I don’t think it will improve my daily quality of life the way that these other things would. I also don’t believe the state will find another $64.5B to spend on sustainable transportation in the next few decades, but if it does, then regions will have the extensive transit networks needed to enhance the value of statewide HSR. The guys behind ‘Plan B’ have been complaining that the initial construction segment of Madera to Bakersfield is a ‘train to nowhere’. How is Madera to Fresno less of a train to nowhere? Because it’s less of a train, period. Yes, but much of the increase in price is due to inflation. Definitely! It just seems to be a reallocation of HSR money to urban projects that only benefit these areas, not to actually construct an HSR system. Major public transportation infrastructure projects produce the most jobs per dollar spent. We need HSR sooner rather than later. Absolutely. The Prop. 1a funds require at least 50% match from other funds, and once we punt away the $3.3B of federal funds then the Prop. 1a funds will also be unavailable, now or in the future. So we’ll get nothing, no jobs, no improvements to existing systems and not the first 130 miles of the statewide system. “Heard it on the X” by ZZTop in “Railroader”, a movie on the High Speed Rail. Labor is a cost, not a benefit. The rail lobby in California has also scrutinized the project. It’s not always the oil and road industry boogeymen. Plan A is unrealistic as well. You’ve got Dan Richard releasing a video saying that the blended plan will not only cost less, it’ll still meet the unrealistic requirements set forth in Prop 1A. Yet through a Freedom of Information Act request, we learned that there are no documents supporting that the blended plan could do LA-SF in the time limit specified. Build it if you must, but don’t get your hopes up on performance or that it will even be completed. Ending up with an expensive upgrade to the San Joaquins could make rail a laughingstock in California for decades to come. It will be more interesting to see who will donate to the No Rail option, since there doesn’t appear to be a natural constituency other than those who will see their farms and ranches bulldozed by the project. John and Ken have failed to deliver issues to the ballots a few times now. First it was the part time legislature, and recently they failed to get the referendum to stop the California Dream Act on the ballot. They got over one thousand signatures at the Anaheim event, but that is only a start. Will the Republican Party mail out petitions to revote rail to all of its registered voters, like they did that petition to put the Senate District lines on the ballot? Interesting theory, but sadly not the case. Plan “A” is for Caltrain to light $1.5 billion on fire, with little to show for it. For example: the “plan” is for Caltrain to install an PTC signal system that is incompatible with any future HSR trainsets. Metrolink, BTW, is also installing their own proprietary PTC system. So three rail agencies (Caltrain, Metrolink, CHSRA) all using separate, incompatible PTC schemes. Worse, Caltrain and CHSRA are not cooperating on things like platform heights, meaning separate stations for the different services. So now we have incompatible trains and infrastructure. As for speeding up Caltrain with electrification — well good luck with that. Caltrain electrification managed the seemingly impossible trick of increased operating costs with hardly any improvement in travel time. Plan B is dead on arrival since it would lose 3..3 billion in federal money. In other words it’s the same as “no plan at all”. Robert Cruickshank makes no bones about his political opinions, but he is not paid to post; he does it entirely as an amateur. He also presents his evidence and he’s generally right. It’s absolutely the oil and road industry people trying to block it in the state legislature. There are a few nutty rail lobbyists who won’t accept anything less than Scandanavian standards of design, but seriously. 1 – The Transbay Terminal tunnel needs to be completely redesigned. 2 – The federal money is for Central Valley or nothing. 3 – Intercity rail between SF and LA will change the attitudes of people in California, *particularly in the Central Valley*, in such a way that it will be easier to get more local rail in SF and LA than before. All the evidence is that WinstonK is correct. An expensive upgrade to the San Joaquins would be… extremely popular and successful and would lead to the construction of the Bakersfield-LA tracks. Plan B is nothing more than fake “green Libs” and their stupid backyards and OF COURSE THE 80,000 Dollar Landrover..I did not vote for prop 1A so that yups can come into SF faster,.,, I voted for HSR from SF-LA . Of course Cruickshank is a Democratic hack, and is a top aide to Seattle Mayor Mike McGinn. But that doesn’t mean that he provides valuable arguments for HSR, and his blog entertains the many HSR critics who post there, which to his credit he doesn’t shut down. He basically covers the technical missteps of HSR in California and American railroading in general. Unemployment is a cost, not a benefit. 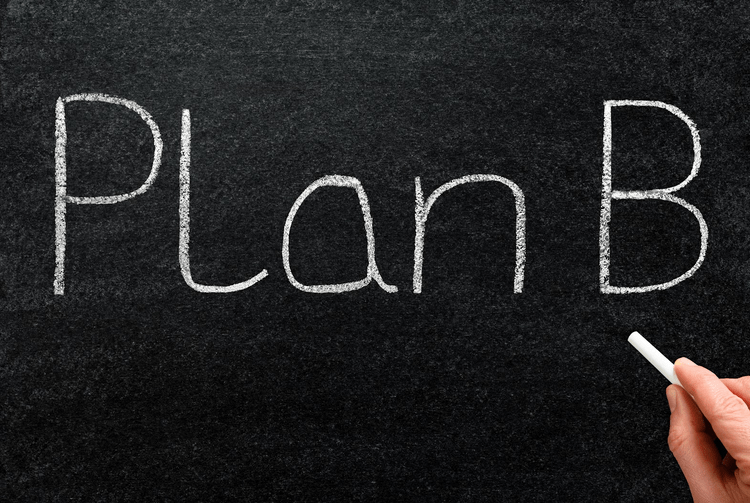 No, Plan B is no option at all, because NO BOND MONEY can be spent WITHOUT the federal money. Prop. 1A expressly requires a 100% match of all funds spent from the bond – without the $3.3 billion in federal stimulus money, there are no matching funds and no construction can take place anywhere. Plan B is, effectively, the No Rail plan.